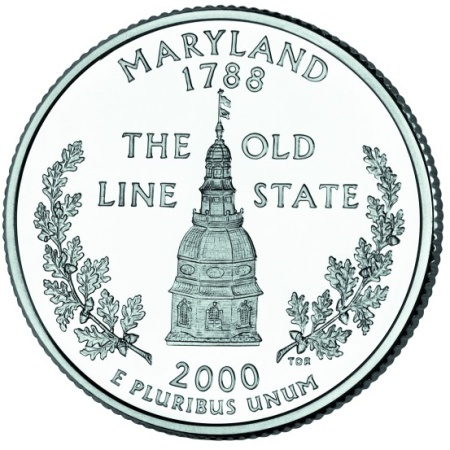 The Maryland State Quarter is the second state quarter released in the year 2000 and the seventh released in the series which was authorized by the 50 States Commemorative Coin Program Act. 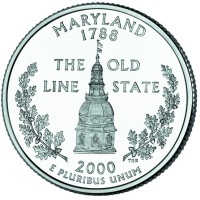 The MD State Quarter was released on March 13, 2000 with The Old Line State as the design theme. The Old Line State is the nickname for the state of Maryland in honor of its "troops of the line" who were praised by George Washington, commander-in-chief of the Continental Army. The design features the Maryland Statehouse, a historical building built in 1772. The historic structure served as the nation's first peacetime capital between 1783-1784 and the Treaty of Paris, which officially ended the Revolutionary War was ratified there. The Statehouse is the United State's oldest state capital building still in legislative use and features the largest wooden dome built without nails. The MD State Quarter design also includes leaf clusters from the official state tree, the White Oak. The Maryland Commemorative Coin Committee, established by the Governor of Maryland for the express purpose of designing the state quarter, made five design recommendations with the governor making the final decision. Below is a table showing the design specifications and mintages of the Maryland State Quarter. Note: The modification moved some of the wording from the reverse to the obverse to leave the reverse available for the state's design. Reverse - Each state theme was proposed, and approved, by the governor of the state. Final design was created by Thomas D. Rodgers. His initials appear just to the right of the date.